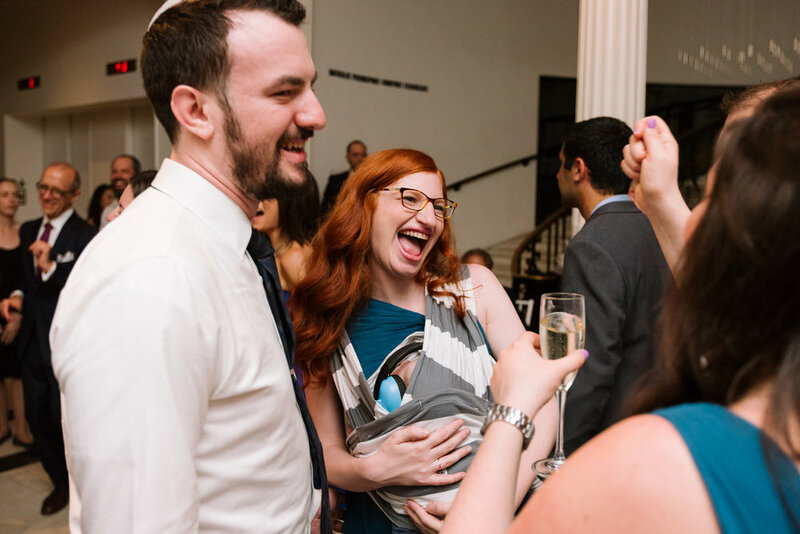 We met at a New York League of Conservation Voters meet and greet for new young members, but Evan had actually noticed Rebecca at another event a couple of months earlier. Honestly, we clicked right away. We both left the meet and greet that evening and called our parents to tell them we’d met the most amazing person. Within months we knew this was something special. We started talking about moving in together after Evan’s lease was up (how New York, we know) and after Rebecca finished her Masters degree. For both of us, we felt that moving in together held the same type of long-term and solid commitment that engagement did, and so it wasn’t exactly a surprise when Evan proposed a couple of weeks after Rebecca graduated and a month or so before his lease ended. The best part of the wedding day was definitely the party. After all the jitters of finalizing details and dealing with more logistical things all morning it was unbelievably exciting to just dance it out and have some fun. As for the planning process, we were lucky enough to get to do our engagement shoot with Alexis, in addition to the wedding, and it was just so fun to run around Roosevelt Island’s Four Freedoms Park together, a really great break from the more stressful list of to-do’s before the wedding. We also loved all the food related planning, tastings, menus, and ice cream deliveries, it was perfectly delicious. The most important thing for us was making sure that we had fun, both during planning (not always possible) and at the wedding. To us that meant finding the best vendors for our vision. 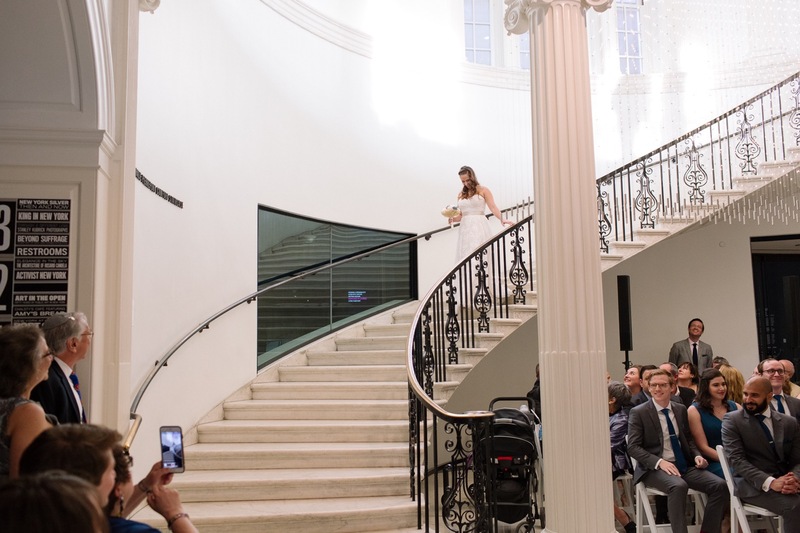 We already knew we loved Alexis’ photo style (she photographed a close friend’s wedding years earlier) but it was important to us that each vendor understood that just because we were getting married in a museum it didn’t mean that the wedding was going to be uptight or too fancy. Having a million food options, dance music for every generation, and a healthy dose of nerdy museum moments were all part of that plan. It was important that everyone had an amazing time, but we really wanted to throw a party that represented us and our relationship at the same time. What surprised you most about your wedding- planning, celebration and afterwards? We were incredibly lucky, though there were of course stressful moments throughout planning, we were surprised at how smoothly the actual wedding day went. You’re always waiting for that one thing to go wrong (and it totally did!) but it didn’t change how amazing and personal the day felt. Everyone kept telling us that you don’t really remember your own wedding, things move too quickly, but we both remember so much, and we couldn’t be happier with how it turned out. This is your wedding, if there’s something you really want that day, or don’t want that day, make it happen. Compromise with each other (that’s definitely part of any relationship), but don’t let anyone else drive you crazy. At the end of the day, you want your wedding to have as many positive vibes as possible, you’re going to remember it forever. Rebecca - The end of the night, our feet up on the couch, wandering through NYC in our wedding best. But really, the best part of the night was that moment toward the end where things were quieting down, we started heading to the bar, and we knew -- this is forever. New York City can sometimes feel like a really big place. Other times, you marry someone who lived just down the block from you for the first year of your life. Sometimes you have matching baby pictures of you in the same swing in the same park probably only weeks apart. You had friends and acquaintances in common through your teen years. And yet, it took 26 years to meet. At least we have the rest of our lives together. Thank you, R + E!